Hiring is an important, but very challenging experience for many companies, especially growing companies. In this interview Ramon Ray gets insights from executives at Hire (a Google app). I spoke with Meagan Hency, Product Marketing and Berit Hoffman, Product Lead. 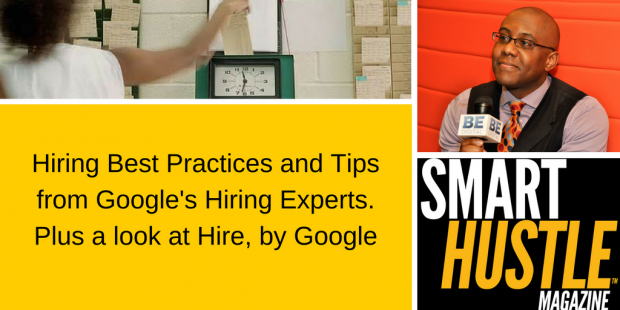 They shared 3 important tips related to hiring and careers and more. Have a career section on your website. Google can index this and showcase your vacancies on its job board. Keep an active database of candidates so you have a fresh pool of talent to look at when needed. Ask for feedback quickly. Know what are the needs and challenges of your current employees and prospective employees. You can read our full transcript below and hear the interview. Ray: Hey everyone. Good afternoon. This is Ramon Ray, editor of SmartHustle.com, and this is the Smart Hustle Report on Small Business Trends. I'm Ramon Ray. I hope you're having a fantastic day. As we tape this, it is blizzard and snowing in the New York area, but by the time you listen to this, we'll probably all be thinking of sand and beaches, but I digress. Meagan and Berit, thanks for being with us today, and I know you're from the Google Hire Team. Why don't you all just take a few seconds and say hello, and give us your titles, and a little about yourselves, and then we'll dive into discussions today, all about hiring, best practices, trends, and to talk about this relatively new, I think it is, tool from Google, Google Hire. I will turn the floor over to you ladies for some brief intros. Berit: Absolutely. My name is Berit Hoffman. I'm the product lead for Hire. A little bit of background on me, I've been in product pretty much my whole career. Previously, was actually on the infrastructure advising. I worked in Enterprise Storage, made the transition to working on applications about five years ago, and joined Google about two years ago. I'm really excited to be here today. Ray: Awesome, welcome. I got the name wrong the first time. It is Berit Hoffman. I got it down now. Thank you, Berit. Meagan : Hi, my name is Meagan . I'm lead of marketing for the Hire application, here at Google. My background is in business software. I've worked for a number of start-ups, so I know the challenge that I think most of the listeners face here, and I'm kind of excited to bring a solution to help companies that are growing, hire more effectively. Ray: I appreciate that. Maybe first, if you don't mind, no specific question, but stats and trends, I'm curious, how do you personally see the market, or Google. I'm sure you read the industry reports from all kind of vendors, but as we're taping this, it's spring 2018, what does the market look like? What are some trends or stats that we need to be aware of? I know I did an interview, ironically at South By Southwest, and one thing the guy was saying was that a stat was corporate culture. I don't want to deviate from my question, but the question is Berit or Meagan , is that talk to us about some stats, trends, where are we at in 2018 early here, and which will probably be the case going on. Meagan Sure, this is Meagan . One of the things I'll share that we hear from businesses overall, is that hiring continues to be one of their biggest challenges, and kind of guiding factors for growth. That's part of the reason we brought this application to the market because we saw as businesses are growing, hiring is a key focus and a key challenge. It's really hard for businesses to find the right people. Particularly right now in 2018, where in the U.S., the unemployment rate is actually at an all time low, that just makes it even more challenging to find and hire the right people. Ray: Got it. So it's kind of a double-edge sword. Low means it's good because our economy is good, but it also means it's hard to find people because nobody is looking or "available". Am I right? Is that the conundrum as I see it I believe? Berit: Another interesting stat that I can share based on some U.S. Census Data that we were looking at, and this is particularly relevant to the audience here. Some of these small businesses that are in their first year of existence. We actually find that businesses in their first year on average have three times the number of job openings as a company that's more mature in later stages of growth. So, that's something that I think is probably intuitively makes sense. Companies do a lot of hiring as they are just starting out, but it was interesting to see how big that delta really is. Ray: Gotcha. Yes, these are important things to consider. I think it's interesting as you said it is like duh, intuitive, but I think we don't think about the hey I'm starting up. I've got a lot of vacancies relatively to the size of my company of course to fill. What about best practices? I know that besides things like don't be a moron, don't harass people, don't steal. I just feel those things our mothers have tried to teach us, and dads. What are some things you all are seeing that you'd say every company, listen, when you're hiring, when you're growing, here's some of the things you've just gotta do, or that maybe you see successful companies are doing right. Can you talk about that a bit for us? Berit: Yeah, absolutely. So this is Berit again. In the development of Hire, we've spent a lot of time talking to companies, talking to small and medium sized businesses who are doing hiring and really trying to understand what's working for them, what's not. What are pain points. I would say these best practices come out of hundreds of conversations and inquiries and research that we've done. I think there are three important points that I find are sometimes not completely obvious to small companies. The first is that your candidate database is probably one of your most valuable assets as a company. I think sometimes companies that are small kind of forget that. They think I don't have that many resumes, I don't have that many people applying. We find that actually very quickly you can start to develop a database, even as a small five, ten person shop, you can very quickly develop a database of thousands or even tens of thousands of resumes, people that you've interacted with previously. Maybe the timing wasn't right or maybe someone else ended up being the best fit for the role, but these were kind of silver medalist type candidates. So one of the best practices I would say is it's really important to keep data on those profiles, on those resumes. Keep track of why didn't you end up not moving forward with them. If it was purely a timing issue, you may want to circle back in a year or something like that. You want to keep track of what feedback you got on them, all of that. It becomes a very valuable asset very quickly. There's two other best practices that I'll call out. One is we found out that a lot of small companies didn't necessarily realize the importance of having their own career sites. They kind of thought hey I'm pretty small, people aren't going to find my career site necessarily. I think especially with the introduction of Google for Jobs, which you might be familiar with, it's actually indexing the web and presenting jobs right on Google.com. In order for jobs to get picked up in that search, in that index, having that job on the public web is really important. That's going to help you reach a lot more candidates. It's really a free way of getting your job posting out there. Ray: That is an amazing gem and nugget. So many times we think about the traditional online review, some of the things we know your peers in probably the cubicles next to you, you know the zillions of people we all know, but I didn't realize that. That's like a ten million dollar idea, thank you! Love it! Berit: It is. It's definitely a great thing to take advantage of for sure. And then the third thing I'll call out is just the importance of getting feedback in quickly, getting it recorded, actually having it written down and in a standardized format. I think it can be very tempting, especially for small companies to kind of say hey we all know each other, we can just get in a room and talk about whether we like this candidate or not. But you're really doing yourself a disservice by not collecting that feedback in a structured way. One is again circling back to my first point, that feedback becomes a very important signal if you ever want to come back to that candidate in the future. Second, I think that having people actually write down their thoughts before they are starting to talk about it can really remove a lot of bias, because otherwise it's very easy to get in kind of a group thing because you are talking about it. So it's important to write it down and kind of see where everyone is to start with. Then go ahead and have that discussion and talk about where there might be disagreements, but it helps remove bias to have it written down. The third is that having it written down really allows you to be clear about what do these ratings mean. If we're at a one to four scale, being explicit about a three means that I would hire this person, a two means that I wouldn't. Just standardizing on the three and two and all these numbers actually mean the same thing to everyone. Ray: That's a great point. I think I'm actually going to do this with my children and rate myself. Let's move into now a bit, kind of right before we talk about Google, and it is Google for Hire or Google Hire, remind me again the proper name. Berit: It's just called Hire by Google. We are part of a Google team, but it's just called Hire. Ray: Got it ... Hire. I may ask you that five hundred more times, but okay Hire. Let's talk about, and again educate us and the audience and myself I'm curious. I get it if you're a huge zillion dollar company or you have a lot of employees like Google for example, other companies. You're definitely going to need systems and platforms and strategies. Talk to me to the company that's not just starting up but is very small. They are doing it I guess with paper, I don't know how they're doing it. When they know they need assistance, let's not talk about Hire right now, you know the ins and outs, but can you educate us on, you have three employees, four employees, five employees, or ten. What are they doing without using technology or systems? What is the tipping point when they need something. Paint a picture for how we start or why we need even a system, if that's not too pedestrian of a question. Berit: No it's a great question. This is Berit again. So I think first I'll address the part of how are companies handling this if they don't have any system in place. Interestingly, that's a large base of our customers who we see buying Hire, they are effectively coming off of no legacy system in place. The way that they're handling it is actually through a lot of emails, you know just keeping folders of resumes as they come in. Like you said doing some of it, actually collecting, writing down notes, pen and paper. What ends up happening, I think the tipping point is really when you start to want to collaborate as a team on hiring decisions, having a centralized place where you can kind of all be on the same page about what has been the lifecycle with this candidate. You know, have that reference point where you can really collaborate and work together on the hiring decision. Typically, we, again like I said we see a lot of green feel kind of brand new customers coming over. We actually have quite a base of customers with even just ten people. Actually we have some customers have said to us I never thought I needed this tool, but then once I started using it, it was like wow we can collaborate in a way that we just were missing before. Ray: Yeah, and I used to work for United Nations for many years, and it's not the exact similar scenario, but we had to recruit many interns, sometimes I would do three a season. So maybe it's a similar thing that I can imagine. I remember we printed them out on paper, I had folders, I maybe had some rudimentary database, I'm only in my 40's, I not like an 80 year old guy or 5,000 years old. But the point is, we didn't have that tool. We didn't have an auto [inaudible 00:12:32] system. I remember we would manually put numbers, because I think that's intuitive to a degree right? We'd put numbers in the top right, and then we'd kinda do hand raises and chat through it that way. But if we could have just click click click click click ... I don't know, Meagan and Berit, we should have had you back then. It would have been a lot easier! Let's dive into Hire itself, and again whether you want to do me a feature, feature comparison, I don't think it's necessary, but let's talk about just Hire on its own, not comparing other tools and etc. What is it? Why is it important? How are you finding people use it? Maybe paint us a visual picture. Many of us know Google, so I know we know Forms, we know Gmail, and the many other things Google does if that's helpful, but why don't you all paint us a picture of what is Hire, what is it? What are some of the key things we need to know about it, especially now in light of the discussion we've just had setting the stage for why we need these tools in the first place. Berit: Yes, absolutely. I think the best way to answer what is it is to tell you a little bit about why we built it. So I mentioned that we spend a lot of time, you know recruiting in general I think is a space that Google is interested in and feels that there's still a lot more that technology can do to make the whole recruiting process, both sides of the market, the employer side and the job seeker side, a better experience. As we were kind of really thinking about the recruiting space, like I said, we spent a lot of time talking with companies about how they're recruiting today. One of the facts I guess is there are over I want to say 3.5 million, or 4 million maybe, it keeps growing, businesses who are using G Suite already. They're using Gmail, they're using Calendar, they're using Drive, Docs, Sheets, to do a lot of the work that happens for their business. As we were talking to these companies who were already using G Suite, we found that a ton of recruiting activity was actually already happening in G Suite. People were emailing candidates in Gmail, they were scheduling interviews in Calendar, they were collecting feedback in Docs, they were keeping lists of candidates in Sheets. All of these things, and in hindsight again, maybe this should have been one of these obvious things, but there was kind of this ah-hah moment that we said, you know, actually these tools that people are already using, that they love to use, why not build a system that can really integrate natively out of these, and allow people to work where they already want to work. The other observation was well these tools are great for these kind of one off communication or scheduling interviews, they alone are not enough to run a really collaborative, efficient recruiting process, because they themselves don't have an understanding of what that process looks like, who the candidate is, you know a centralized view of the candidate, the ability to post a job board, all of these things were missing. So that was kind of the opportunity we saw for building Hire. Let people work where they're already working. Bring that data that's already happening and being collected in G Suite, bring that together but with an understanding of the recruiting process as a whole, and who the candidate is. Really like I said, kind of meet people where they're already working. Ray: Got it. Makes perfect sense. Okay. Meagan: This is Meagan . I was just going to add, you know I know it's challenging to paint a picture over a podcast or this conversation, but just to simplify it. What Hire is, is a web application, and it connects to the Google tools that these businesses are already using. So it connects to Gmail, it connects to Docs, it connects to Google Calendar, and basically enables an efficient recruiting process across those things. As Berit was describing, the process of collecting candidates, people applying to jobs, Hire makes it so that those people automatically get filed and tracked in a way that makes it easy for a team to collaborate on reviewing resumes, gathering feedback, and actually hiring folks. Really everything that we've done in building Hire is meant to integrate within the types of activities that a business owner or leader might already be doing, but just optimize those processes for efficient recruiting and hiring. Ray: Yeah and I was going to say that I can imagine that number being 4 million and growing customers using G Suite, are probably using Forms, as you said using the calendar and using the email and hobbling all this together they were doing it, poor people ten years ago or whatever, before Hire. Now it seems like maybe it's using those tools and more as you guys were hinting, I'm just repeating it, and just making an integrated process, ready for the hiring process and using best practices. Seems like that kind of to me. Meagan: Exactly, exactly. And maybe just even put a finer point on kind of what Hire is, it really does span that whole lifecycle of recruiting. So it's everything from creating a job, posting that job to job boards if you want, but also obviously to Google.com so that it's searchable. It is collecting applications, so we will actually host your public career site for you. We will route those applications to you, you can review them. Again, we talked about that candidate database. We start a map in that candidate database and give you really powerful tools to search and mine that database. We let you schedule interviews, collect interview feedback, define and track that process all the way through from evaluating the candidates and making a hiring decision. You know either hiring or passing on someone. Meagan: Yeah, so we charge based on business size. It starts at ... For companies under 25 employees, $100 a month. Ray: Got it. And they can use it to measure however many they're hiring. Well I guess yet, as they grow, it will go up from there. Meagan: Yeah hire as many people as they want. Ray: Got it. Got it. Anything else I didn't ask Meagan and Berit? Anything that I didn't ask? Anything you wanted to bring out that I didn't talk about? I know in this short discussion we can't solve all the world's problems, but I always hope with these interviews is we can leave one little nugget, but you all left a big nugget for people. But anything I didn't mention or ask you today? Berit: I don't think for me, I mean just a really enjoyable conversation. I think the maybe last thought that I'll leave with is, and I think Meagan alluded to this at the beginning, hiring is just such a critical thing that businesses do. Just from a personal perspective and thinking about kind of how can you really impact and help companies. I think providing them a tool to collaborate more and run a more efficient process for what is arguably the most important thing they do, which is decide who's going to join the company. I think that's exciting and so I always love these conversations. Ray: No, absolutely. I've appreciated it very much. Once again ladies and gentlemen, we've been talking to Meagan and Berit with Hire, which is a Google service, Google product, part of the Google platform of services. And this is Ramon Ray who loves to eat burnt pancakes every Saturday morning. You've been listening to the Smart Hustle Report on Small Business Trends.